Last week, a vendor walked into the DanvilleComputerDoc.com offices. During our conversation about what we do and what he does, he said he found it difficult to effectively differentiate himself from his competitors. He knew that I helped clients with digital and print marketing and asked my opinion on where he should begin. To be honest, I’d seen his business card before and wanted to find a way to talk to him about it without being too pushy — after all, he was there to sell me on his product, I wasn’t seeking his business as a marketing client. So, I took this opportunity to broach the subject. I asked to see his business card. He handed me the same card he’d handed me a month prior. It was not impressive. I’m blunt by nature (and he did ask for my opinion), so I told him it was bland at best and that it wasn’t helping his marketing efforts. He asked me why, and what suggestions I could offer him to improve it. Spend the extra couple of cents per card to have a nice, sturdy looking business card — one that FEELS as good as it looks. If your services or products are well-crafted, a sub-standard business card belies the quality of the things you offer potential clients and customers. A couple stiff rubs with my thumb and the ink smeared. Please, always use UV coating on your business cards. It not only protects the ink from smearing, it also prevents the colors from fading and will make the cards less likely to become victims of moist environments, accidental spills, or even a few raindrops on the way to the car. 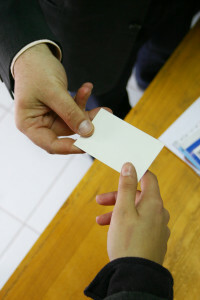 His card overwhelmed the potential client with too much information and too many options. Don’t make someone have to ponder how to contact you – make it easy. The only decision you want a potential client to make is to contact you instead of your competition. People hate making decisions — especially unnecessary ones. The individuals you are trying to reach make decisions all day long and are sick of making them. Do not force a potential client to make another decision on WHICH method they should use to do so. Make it easy for them. Think “preferred” method of contact. The gentleman I was talking to said that he hated it when people called the main office number to reach him — that his cell phone was the best way for him to be as responsive as he wanted to be. Yet, his main line was printed on the business card. Sure, we all hate photos. I despise them, personally. But I still have one on my business card — despite how uncomfortable it makes me. Someone who has met me at an event will remember WHICH person handed him my card, and will be more likely to remember the conversation long after the event — thanks to a photo on my card to help them with visual association. Help people make the connection. If you use a photo, be sure to use a recent one that actually looks like you. Don’t “Photoshop” it to the point that it’s no longer you. Don’t use a photo that you love from 10 years ago. Just swallow the pride and get a good, professional photo made and move on. Effective use of “white space” is essential. Most advertising folks know this. Few business card designers do. A card that leaves your eye darting all over the surface, means it’s not a smooth package. It’s also not good at conveying information. My own card is a “mini” card. And although I use all the space (front and back), it displays the most important information prominently. There’s no doubt about who I am and what I do. I keep it simple. You should too. A good tagline will tell people what you do, how good you are, and why they need to contact you. It should be a message that delivers what you can do for them. Approach it from service, product, longevity, skill — any aspect that you “own” in comparison to your competition. Steve Knight has been a tech-geek since the 1980’s and he leverages his “Computer Doctor” theme — the result of a background in Chemistry, Microbiology, and years of experience in the Healthcare industry — in his uber-short tagline: “Healthcare for Geekware.” Rhyming isn’t a necessity, of course, but it does help to make it stick. Think about what you do, how you do it and what sets you apart. Keep it simple. Keep it short. Avoid anything vanilla. (I’ve worked with real estate agents for years and every time I hear something like, “Everything I touch turns to ‘sold’!” I want to scream!) Be original. Remember to have fun with the process. Play with the words until you find your own tagline. Then… USE IT. Branding is a long-term process and (with all the emphasis currently placed on digital marketing) the power of a simple business card is often overlooked. Your “not-so-lowly business card” is one of the best, most economical places to begin rethinking your marketing and gaining an edge over your competition. Dovetailing your digital branding with printed products is essential for today’s business owners and their employees. ← Windows 8® Causing Headaches? I simply do not think I could continue to use my computer as constantly as I do were it not for the wonderful customer service of Steve Knight, Danville Computer Doc!